Central Airdrie is well-represented here with Stirling Street, Graham Street and South Bridge Street featured together with some interesting streets a bit further out. Airdrie FC in pre-administration days (who said a diamond is forever?) feature on two pages and railway buffs will enjoy the Shanks & McEwan pug. Amongst the areas on the outskirts of Airdrie that have been included are Rawyards, Clarkston and Drumgelloch. There are some great tram photos both in town and near the car terminus, and a wonderful picture of Airdrie's sewage works in 1935. My personal favourite is of the villa Arranview, designed by Alexander 'Greek' Thomson. 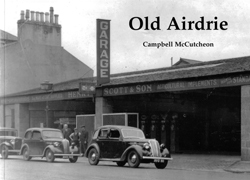 Overall, Old Airdrie is a good mix of town centre and other subjects. Originally published in 1994, it has subsequently been through several reprints, testifying to its popularity.